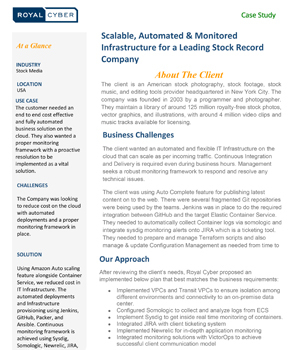 The customer needed an end to end cost effective and fully automated business solution on the cloud. They also wanted a proper monitoring framework with a proactive resolution to be implemented as a vital solution. The Company was looking to reduce cost on the cloud with automated deployments and a proper monitoring framework in place. Using Amazon Auto scaling feature alongside Container Service, we reduced cost in IT Infrastructure. The automated deployments and Infrastructure provisioning using Jenkins, GitHub, Packer, and Ansible. Continuous monitoring framework is achieved using Sysdig, Somologic, Newrelic, JIRA, and VictorOps.